Based in southern Germany, Dürr AG is a global system partner to the automotive and supplier industry, and is the global market leader in painting, balancing and cleaning technology. The ADP/Systems Robotics division at Dürr manufactures painting robots. As such, Dürr not only designs and programs moving and stationary painting robots for interior and exterior painting applications, but also so-called automated handling robots: these are small, intelligent helpers that can open, hold and close car doors and bonnets. The robot systems are in use around the world, in places such as Melfi, Dingolfing and Shanghai. In the last three years alone, the number of Dürr robots installed worldwide rose to 7,300. 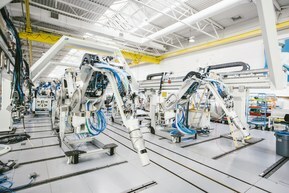 When it comes to the cabling – such as the drive system and the control system – that enables the robots to enter operation, Dürr relies on the expertise of LAPP. This is an area in which demanding requirements must be met – it's not just drivers that have extremely fixed ideas about the paintwork of a vehicle, but also the automotive manufacturers. Frequent model changes, new vehicle designs and new painting systems demand a high level of flexibility and innovation, and the same applies for the production systems. A Dürr painting robot can switch from one shade of paint to another within 10 seconds, with minimal loss of material. Dürr has managed to reduce the inevitable paint loss to a maximum of 10 ml per colour change – just 2 teaspoons or a half-full shot glass. In order to reach even the most awkward of places, such as in the interior of the car doors, the painting robots must perform extreme rotational movements and alternating bending movements. The cables therefore need to be highly flexible, have a very small bending radius and be able to withstand high torsional loads. There are also high demands made regarding the quality and durability of the components, as they must accompany these movements millions of times over without sustaining damage. An additional issue is the limited space available for cabling: a variety of different cables often have to be installed in the smallest possible space in the interior of the robot. For this reason, hybrid cables are frequently used in robotics as these combine multiple cables in a single outer casing. This can involve high-voltage cables for ensuring the necessary high energy supply being combined in a small space with data network cables, for example. The demands are just as high when it comes to electromagnetic compatibility (EMC) and the corresponding screening designs for all components. The challenge in this regard is that the hybrid cables must also provide a high level of flexibility and stability in response to the permanent load generated by the rotations and alternating bending movements, despite the presence of multiple cable harnesses and multiple forms of screening and filling material. "Our robots use cables that are subjected to huge loads", notes Heiko Kamp from Dürr control engineering product development. "These are torsional movements of 180 degrees per metre that the cable simply has to undergo, not just a couple of times, but millions of times over. We know we can rely on LAPP to deliver this." Each robot type carries out different movement sequences and is constructed in a different way, meaning the cable systems face all manner of challenges too. In terms of exceptionally challenging applications, which are frequently requested, off-the-shelf products often simply cannot deliver the perfect solution. LAPP, with its robotics specialist, Lapp Muller, has been working intensively in the area of robotics for more than 30 years and produces control and data network cables, special cables and the corresponding assemblies. As a result, LAPP was also able to provide Dürr with a customised assembly in addition to the special cable designs. 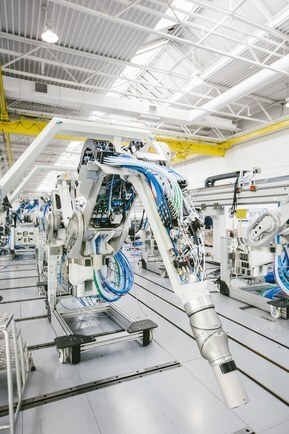 The assembly of special circular connectors allows the cabling to be supplied to the customer as a ready-to-install plug&play solution, thus enabling Dürr to streamline its processes, save time and energy and concentrate more on its core business. What's more, fully synchronised and tested systems from a single source improve the safety and durability of the robots. Dürr solutions can be found all over the world – everywhere that vehicles and vehicle parts are produced – so the company required global alignment of the component suppliers offering global sourcing. With representatives and partners in over 100 countries, LAPP was able to fulfil this need without any problems.